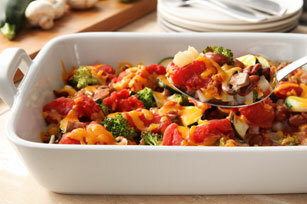 How easy is this cheesy potato casserole with broccoli and tomatoes? So easy you don't even have to peel the potatoes—thanks to frozen hash browns. What's not to love about this oven-baked casserole? Reserve 1/2 cup cheese for later use. Combine hash browns and remaining cheese; spoon into 13x9-inch baking dish sprayed with cooking spray. Top with all remaining ingredients except reserved cheese; cover. Bake 40 min. Top with reserved cheese; bake, uncovered, 5 min. or until melted. Serve this simple casserole with a mixed green salad tossed with your favourite Kraft Dressing. Garnish with 1 Tbsp. chopped fresh cilantro or parsley before serving.